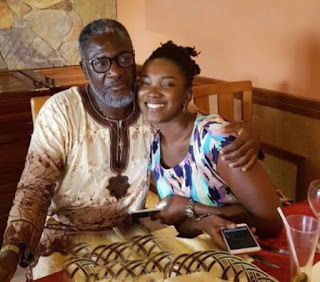 As Ghanaians mark the first anniversary of the passing of late singer Ebony Reigns on February 8, her father is wishing the date is expunged from time. Nana Opoku Kwarteng marking the first anniversary of his daughter’s passing said it was his solemn hope that the date will not even exist. Her childhood friend and assistant, Franky Kuri, and their bodyguard also died in the crash. She was laid to rest on March 24 at the Osu Cemetary. Mr Kwarteng, popularly known as Starboy Kwarteng, remembering his daughter in a video said February 8 is a very difficult day for him. “Today is a very difficult day and like I’ve said already if I had my way, if I had the power, today will be deleted from the books of time,” he said. Mr Kwarteng, who wore a red Lacoste top with a badge of his daughter’s image, added that “8th February is the first anniversary, being today, of my late child Ebony Reigns.